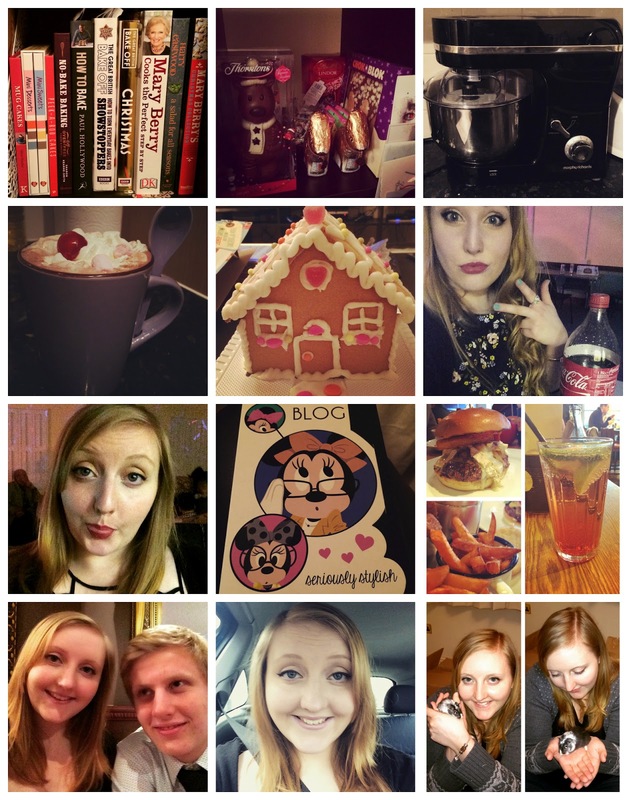 From Top Left to Bottom Right: All my Baking Books, Christmas Chocolate collection, new stand mixer, Hot chocolate with all the trimmings, Gingerbread house, Sister Selfie, NYE Selfie, New Blog notebook, Gourmet Burger Kitchen, Selfie with my bro, Wedding Selfie, and Cuddles with Sven. I don't even know how I have managed to cram so many things into this one week, no wonder I am so tired! Tim and I started off our week by finally organising our Christmas presents and finding places for them all. This prompted a clear out of our shelves, so that I could fit all my baking books onto them. Well I wish they all fitted on one shelf... some of them are actually floating around on a separate shelf... This also meant we had to find somewhere for all of our Christmas sweets and chocolates and thankfully we have a few spare shelves on our TV unit which is now housing a tonne of chocolate. I finally ordered a stand mixer! I settled on one by Morphy Richards which was £69.99, my plan is to use this one for now, and then to save up all my money to buy a Kitchenaid later on, maybe when Tim and I finally move into our own place (I can dream right?). Tim and I have been very naughty this week before our new diet kickstarts next week, we've eaten far too many sweets and treats, including building a gingerbread house, drinking hot chocolate with cream and marshmallows, AND going out to Gourmet Burger Kitchen for lunch... All I can say is I'm going to miss all of these treats when our new lifestyle really sets in next week. I've also attended a few events this week, of course it was New Years Eve on Wednesday, and we went to a party in my village, and there was a lot of drink and dancing. To be honest I didn't drink too much, Tim maybe had one too many, my 16 year old brother on the other hand came home completely sozzled, having managed to sneak a LOT of alcohol from under my dad's nose. Tim and I left the party early and went home to bed, and were rudely awoken at about 1:30am by my Dad barging into the living room demanding that I go and help him sort my brother and sister out who were royally pissed. I managed to get them out of the kitchen and up the stairs then as soon as I had settled myself into bed I heard dad shout, 'Oh now he's chundered everywhere', of course I had to go investigate, and I found my brother in a right old state. By this point my mother had now also been woken up (she was at home ill and didn't go to the party), and obviously was none to pleased to find my brother rolling around on the bathroom floor absolutely paralytic... We all tried and failed to get him to bed, and it took us about an hour of helping, and laughing to get him sorted. I can honestly say I have never seen anyone in that bad a state, he was talking nonsense, and crying... There is video evidence of all of this (which I took to show him the next day), but he's promised to ruin my life if I ever share this with the internet. Other than that it was a pretty good night. Then yesterday I attended a wedding of some of our family friends, and it was a lovely ceremony. It's made me get the itch to get married to be honest... I'm just waiting around for a certain someone to ask! Then when we were outside my sister managed to snap a couple of decent photos of Tim and I, which I couldn't resist sharing. Then to top off an amazing weekend I managed to handle Sven for about 15 minutes this evening! It was lovely, he was running all over my leg very confusedly, but settled down and then didn't seem too bothered. He did give me a little nip when I picked him up to put him back in the cage, but I think I scooped him up too quickly and he didn't like it. Either way, I see that as a success!! Feeling: Tired... and like I haven't stopped at all this week. Looking Forward to: Getting back into a normal routine next week, even though that means going back to work. The Morphy Richards stand mixers are probably the best ones I think, particularly if you're lacking in funds like me!